Who doesn’t love macaroni and cheese? Seriously, it’s a classic combination—gooey, cheesy, salty—the ultimate in comfort food. The best aspect of a basic mac and cheese recipe is the simplicity. It’s one of the few foods where the boxed version is practically as good as “made from scratch.” Mac and cheese easy to cook even for those with limited culinary experience. Store a box in your pantry or cupboard so you can whip up dinner in no time. Plus, mac and cheese is super cheap and you can often find it on sale. Hello, dinner for under $2! But sometimes you want to take your mac and cheese beyond the box. So yea, there are TONS of yum add-ins to ramp up your mac game. 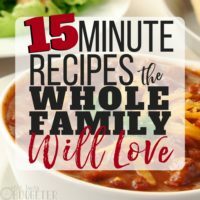 And it's SO EASY – your whole family will love it! You don’t need mad kitchen skills to cook next-level macaroni and cheese. 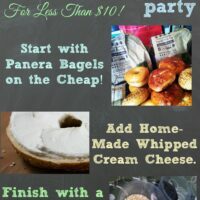 In fact, you can start with the basic boxed variety and add a few extras to really ramp it up (and it will still be a cheap, easy meal). If you’re feeling creative, start with noodles and add your own cheese (or even cream cheese, as they did in recipe #14). Use a tomato base or draw inspiration from your other favorite dishes—Mexican, Spicy Buffalo or comforting spinach artichoke dip (everyone’s restaurant fave). You guys, it’s so easy to create variety with macaroni and cheese. So the next time you have to resort to the blue box (or purple, or yellow, depending on your favorite brand), alleviate boredom with add-ins and extras. So, the MOST basic of basic mac and cheese is usually made from a box. There are a zillion variations, but the boxed variety will get you started down the path of mac and cheese success. Start with boxed mac and cheese such as Kraft Dinner, Velveeta Shells & Cheese, or Annie’s Shells & White Cheddar. Fill a pot with 3-4 cups of water (about twice the serving of pasta). Add a teaspoon of salt. Bring water to a boil. Add noodles to boiling water. Boil 6-8 minutes, until noodles are chewy but soft. Drain noodles in a strainer. Prepare cheese sauce as directed—either adding milk and margarine/butter or straight from the pouch (Velveeta). Stir drained noodles together with cheese sauce until thoroughly mixed. If you want to prepare “next level” mac and cheese, it’s easiest to start with the box and doctor it up from there. 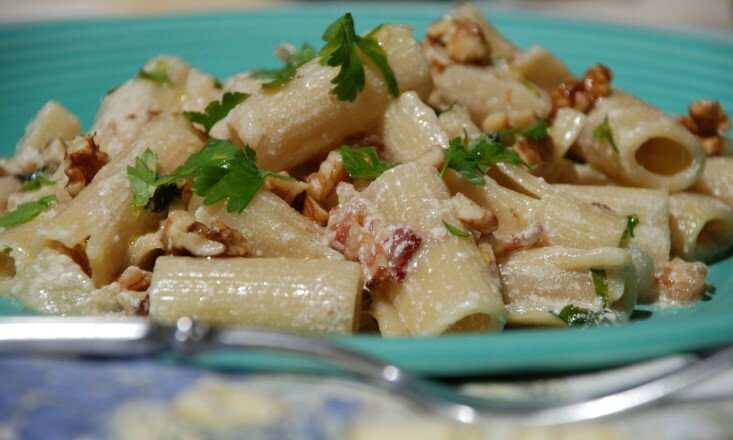 Create your own cheese sauce or buy a jarred cheese sauce such as Ragu Classic Alfredo sauce. Macaroni refers to the shape of the noodle, so if you’d like to mix it up, you can use shells, elbow macaroni or even penne. The macaroni shape holds the cheese sauce well, which is why it’s a classic paring, but feel free to mix it up as you see fit! You can also bake mac and cheese. The simplest method is to prepare a box variety, add pre-seasoned breadcrumbs, extra cheese and simply broil for a few minutes until melted. If you DIY your own cheese sauce, then pre-boil the noodles until they’re nearly done, before adding to a casserole dish and baking. While real baked mac and cheese is awesome and yummy, it does take longer to prepare (and most of us prefer to stick with 15-minute meals or less). The best way to take your basic mac and cheese recipe to the next level is simply add-in additional ingredients to make it even better. It’s simple, fast and will take your meal from basic and boring to delicious. 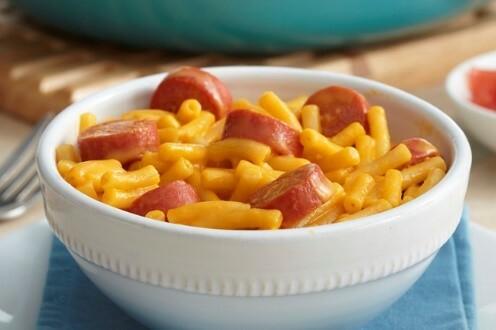 This is a classic paring—mac and cheese with hot dogs! It doesn’t get any better or more comforting. Plus, it’s super easy and will add a little protein to your meal. Once your mac and cheese is combined, add a drained can of tuna (packed in water). Stir thoroughly to break up the tuna. Tuna works great with white cheddar mac to create a “stovetop” tuna casserole. Pasta and peas go together perfectly. 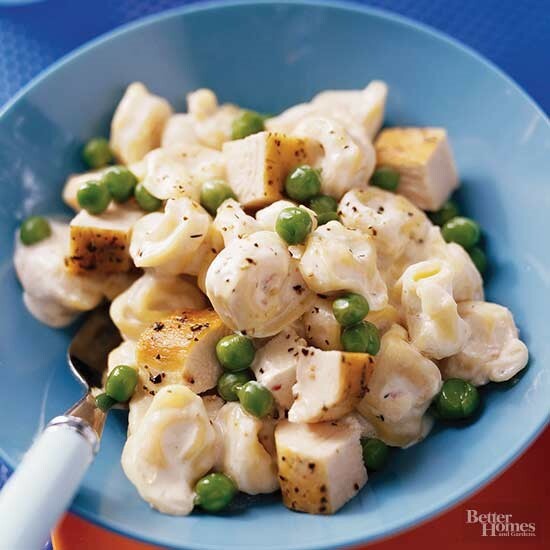 The peas are great with either white cheddar or the classic variety of macaroni and cheese. Boil a cup of frozen peas right with the noodles and stir in the sauce. You can also compose a great cold salad using macaroni noodles, peas (cooked together) and parmesan cheese. Toss with a tablespoon of olive oil and cracked pepper. 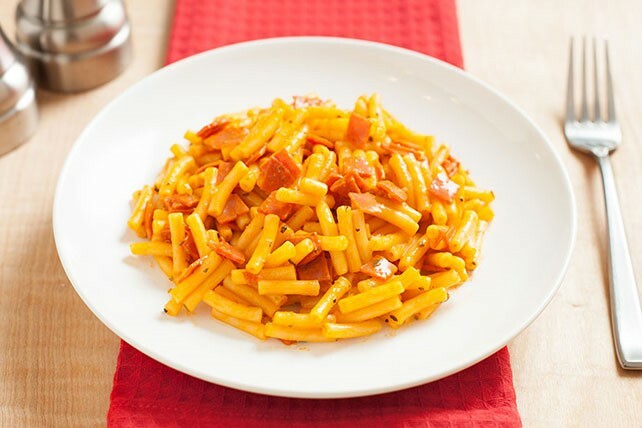 Use of leftover ham by adding chunks to your macaroni and cheese! If you visit the deli, you can also ask them to slice up ham into thicker slices or look for ham steaks (which need to be pre-cooked). Sauté the steaks in a skillet, cube and add to your mac and cheese recipe. Another classic paring is tomato with macaroni and cheese. The creamy cheese goes great with the tangy tomato. Dice a tomato into cubes and add as a final touch to your macaroni and cheese. Or just dump in a can of diced tomatoes and add a bit of chili powder for kick! Tomato soup—the old standby canned variety is the perfect background for macaroni and cheese. Simply boil plain noodles, drain, add in a can of condensed tomato soup and stir a few cups of cheese. Add pepper and you’re enjoying the ultimate comfort food. Peppers go great with mac and cheese and are used to give your dish an Italian or Mexican flair. 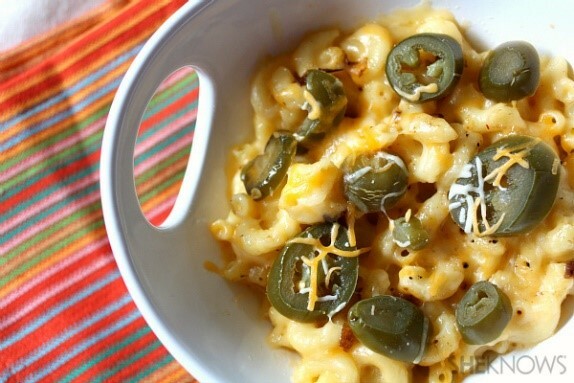 Add jalapenos like this recipe from SheKnows. You don’t need to fix the macaroni from scratch—simply stir in the jalapenos to add a kick to your dish. 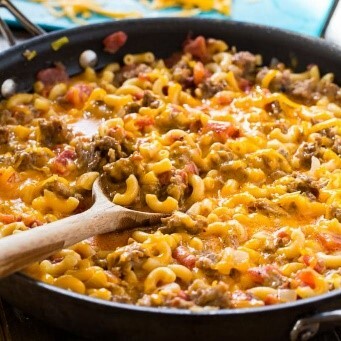 You might call this cowboy mac, beefy mac, chuckwagon mac or goulash. I’ve heard all sorts of variations, but the basic concept is brown ground beef and stir a half pound into your mac and cheese. You can add tomatoes or diced red peppers as well. Adding chili powder really brings it all together. 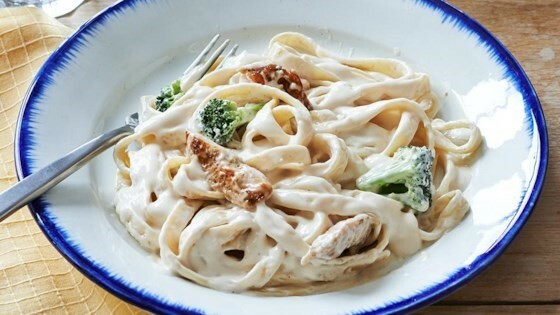 Use jarred Alfredo sauce, cook frozen broccoli with your noodles and top with leftover chicken (or Tyson pre-cooked chicken tenders) for a totally easy take on chicken and broccoli Alfredo. 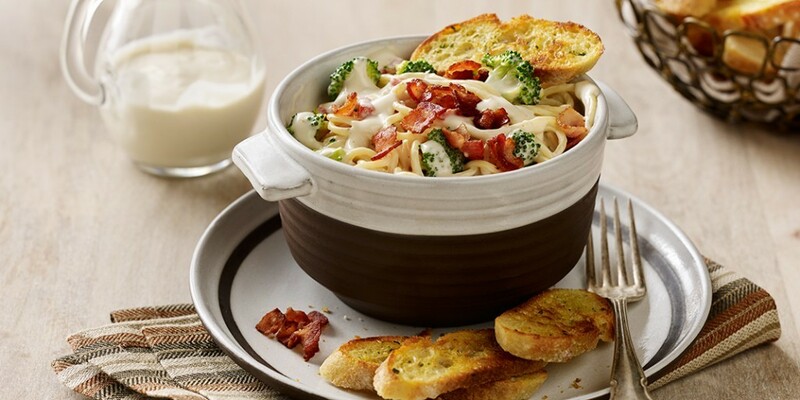 Use fettucine as they did here or mix it up with any noodle variety you like. Just like peas, add frozen broccoli to your boiling pasta water and cook it right with your noodles. There’s really nothing like broccoli and cheddar. You can add extra pepper and even sprinkle with parmesan cheese. Cauliflower is a great solution for those watching their carb intake or looking for gluten-free options (but still craving macaroni and cheese). 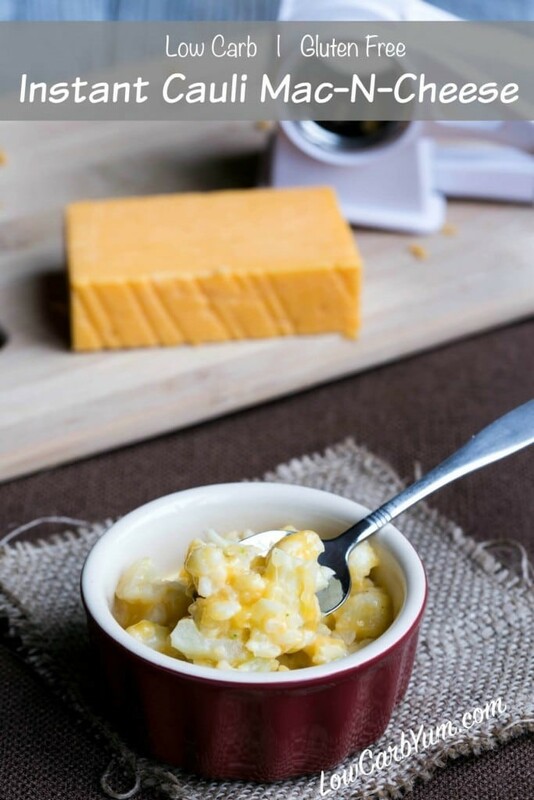 The cauliflower mimics pasta enough that you can enjoy this meal without noodles, or simply microwave cauliflower and use it to stretch your basic mac and cheese recipe —more fiber and servings! If you can’t decide between pizza and macaroni, why not enjoy the best of both worlds?? There are many baked versions of pizza macaroni, but this version has all the flavors and is super simple to cook. It’s a great way to change up your routine dinner. 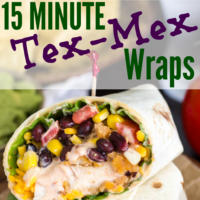 This might seem a bit unconventional but it’s a satisfying and filling option, especially because the beans offer plenty of fiber and protein. 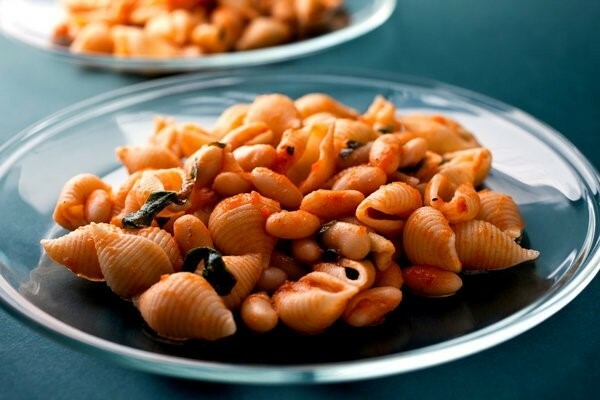 You can either add cannellini beans and tomatoes to your existing macaroni, or forgo the cheese and simply add the tomatoes and beans to pasta. Say what?! Tortellini is absolutely amazing instead of regular macaroni. The cheese is right inside, so you can use less on the outside (if you want to). Take the suggestion and use cream cheese in this recipe, because it adds a different creaminess than regular cheese sauce. Is there a better appetizer than spinach artichoke dip? It’s one of those dishes that’s gone before it even hits the table. 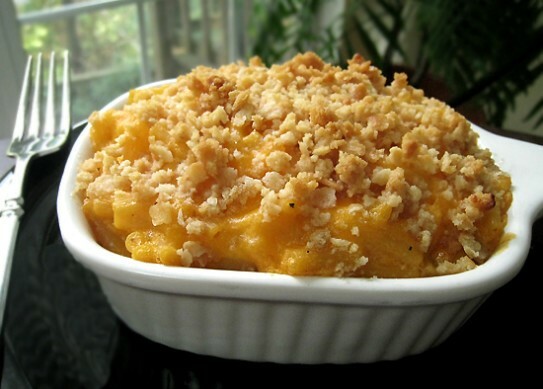 This recipe takes all the flavors of your favorite dip and adds them into macaroni and cheese. She makes her own sauce, but you could easily use a white cheddar variety and simply add in the spinach and artichokes. Yum! Ok, this is a little oh la la fancy, but this combination of walnuts, gorgonzola and pears is absolutely killer. It’s an amazing salad and it totally works as pasta too. You can follow this recipe or simply add a diced pear, walnuts and blue cheese crumbles to your basic mac and cheese recipe. 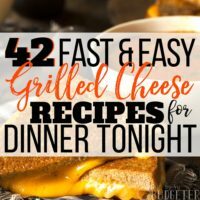 This recipe takes a little more time than the more basic and cheese recipe, but not too much more hands-on work. It is SO decadent, and still uses the regular ol’ blue box mac (but moves it out of this world)! To make Sloppy Joe macaroni and cheese, all you really need is leftover Sloppy Joes! If you’ve made 15-Minutes Sloppy Joes, stir the leftovers into your basic macaroni and cheese from a box. This is awesome, and a great hack if you don’t quite have enough meat left for an entire second meal. Carbonara basically means pasta with bacon. HELLO! You can use batch-cooked bacon for this dish which makes the recipe super simple. This recipe harkens back to Hamburger Helper, which is the ultimate filling dinner. You can make the whole dish in one pan. If you want to speed the cooking process up, sauté sausage and onions in one pan and add them to your boxed mac and cheese and top with shredded cheese to finish. Apples and cheddar are a perfect pair, that’s why so many people put cheddar on their apple pie! Well, apple works in macaroni and cheese too! 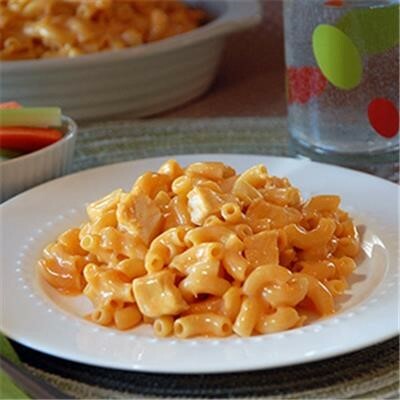 Use your favorite cheddar macaroni and cheese box, and stir in diced apple along with sausage or crumbled bacon. Chicken nuggets are great with cheese and pasta, and this recipe makes it super simple by using chicken nuggets and layering in a casserole style. 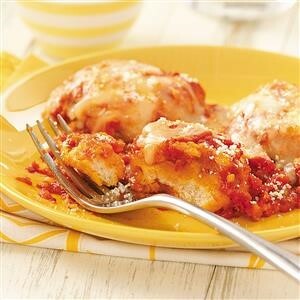 This is amazing if you’re craving chicken parmesan but don’t have the time for a complicated dish. 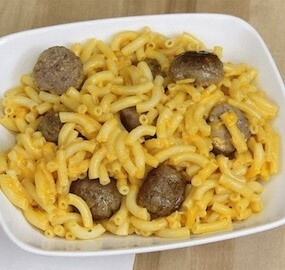 This recipe was created with frozen meatballs, which work great with boxed macaroni and cheese. They add meaty flavor and protein, and take it up a notch to something special. Adding canned, sautéed or fresh mushrooms to your macaroni and cheese is a great vegetarian option. Add tomatoes or spinach to compliment the mushrooms or enjoy the flavors on their own. Buffalo chicken is everyone’s favorite (okay, perhaps not little ones who don’t love spice, but grownups can’t get enough)! Use precooked diced chicken (like the Tyson grilled chicken strips) and this comes together fast and easy. Macaroni and cheese goes so well with barbecue. It’s the perfect combination really—savory, sweet, smoky and cheesy! Use shredded chicken and barbeque sauce to really amp up this combination. Also try this dish with pork as well. So, if you’re faced with an empty fridge and no idea what to fix for dinner, check your pantry. With a box of macaroni and cheese and a can or two of extras you’ll enjoy a delicious, simple meal tonight that won’t derail your grocery budget. 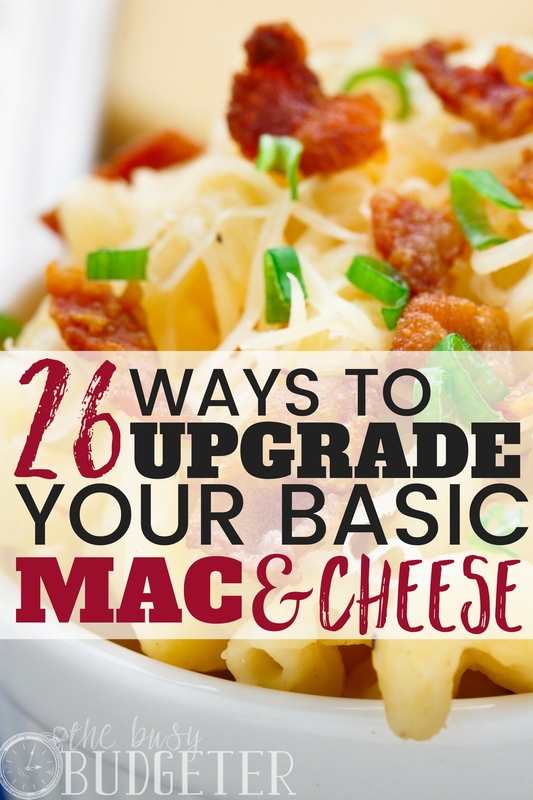 What’s your favorite way to upgrade your basic mac and cheese recipe? Is there an add-in you use to take your boxed meal to the next level? Share your own mac hacks in the comments! Yum! I love mac and cheese and we make it all the time. Adding little “extra” to upgrade it is a great idea. My favorite is ham. We sometimes buy a ham steak specifically as a mac and cheese ingredient, but it’ seven better then it comes from a full ham that was baked in the oven. So much flavor! Thanks for sharing. I love Alfredo pasta. It’s a staple in my house. Sometimes I add in chicken but it also tastes really great with tuna! Looks delicious. 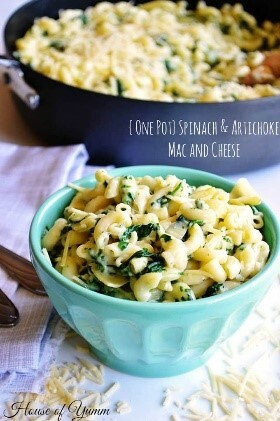 I’ll be trying these for a twist on the classic Mac n Cheese! I didn’t grow up eating mac&cheese, but your photos look absolutely delicious! I grew up eating lots of instant noodles, but it can be really unhealthy unless I add some veggies and healthy ingredients to it. Yummy!!! Why have I never thought about adding things to mac and cheese?! 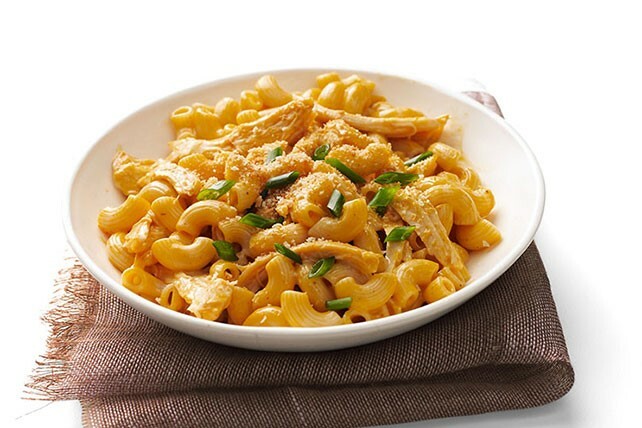 Cowboy mac, baked mac and cheese, and barbecue chicken sound so yummy and comforting! This is brilliant. So far I was able to 3 three yet and would love to explore adding veggies to it. Thank you for sharing. So helpful.